Niche Site Project 4 continues to roll on! Over the past few months, I’ve been working diligently on my site and today I’ll be sharing the results for the previous month (November). In some regards, I was able to accomplish some big things for my site; in other aspects, I didn’t accomplish everything that I wanted to. So, overall, I’ll be reporting on my traffic, earnings, and strategies. 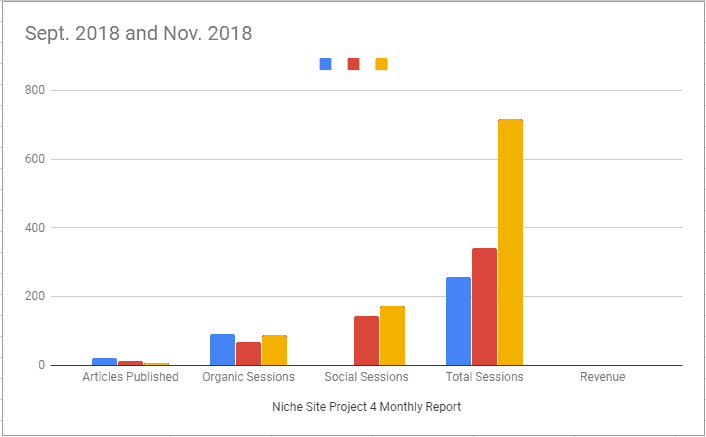 In addition, I’ll be sharing the report from dozens of other people that are participating in Niche Site Project 4 at the end of this post. As a reminder, I wanted to share what has happened in the project so far. So, as you look at this timeline, you will see that as of 12/10/2018 it will have been 3 months since the first article was published. In the grand scheme of things this is not very long at all…but it FEELS like a long time. I probably shouldn’t be checking the stats and rankings daily. Because this is a public project, I wish things were happening faster. However, I also realize that it’s been less than 3 months since I published the very first article, and most articles have only been on the site for a month or two. If this wasn’t a public project, I wouldn’t be concerned at all. But only because I have to share everything so openly, I know the progress of my site is being tracked by thousands of people! Rankings and earnings for niche sites take time. So, overall I don’t have any major concerns. Proof that I didn’t make any money! :). I’m getting some Amazon affiliate links, but no buyers just yet. The trend in traffic was a bit better than my earnings for November. The yellow bar represents November compared to previous months. 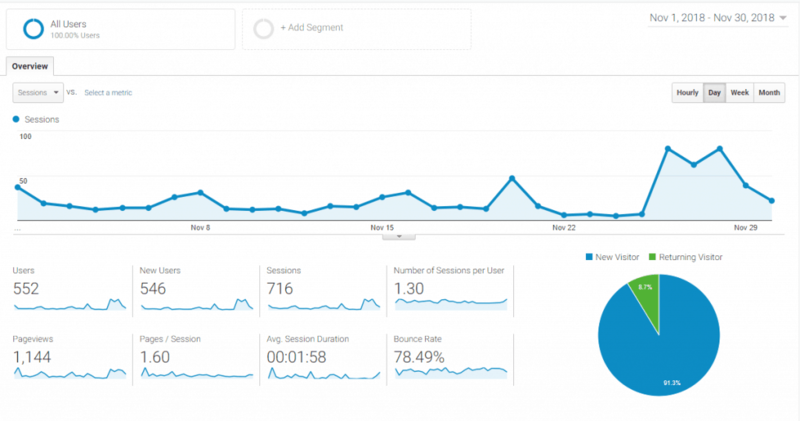 Organic, Social, and Total sessions all increased on the site…great news! Always nice when things are at least moving in the right direction. In fact, when I look at total sessions, the traffic more than doubled from October to November! I know the numbers are still so small, but seeing a 109% increase in traffic in one month is a small win. Again, I know the numbers are small…but this is the case for every new site. However, the above line is the type of thing you want to see with a new site. Now, here’s the raw data for just November. The spike for 3 days that you see around Nov 26 – Nov 28th was a small experiment I did with FB ads. I spent about $50 and drove traffic to a massive pillar article that I had just completed. I wanted to see if this would get the article indexed quicker (it did), and wanted to see if any traffic from FB would buy some products through my affiliate links (they didn’t). However, this experiment did give me some ideas that I’ll explain in a bit. The other spikes that you see in the graph are mostly from Pinterest. What Was Accomplished in November? November had some ups and downs. As with any website, it can sometimes be hard to find consistent writers. I eliminated 2 writers in November and have finally replaced them near the end of the month. As a result, the content production was down considerably more than I had hoped. Overall, only 7 articles were written for the month. However, one of these articles was a MASSIVE pillar article of nearly 13,000 words long! I think this is the longest article I’ve ever published on one of my sites. However, this article is going to be a central topical theme for my site that I’m hoping established my topical authority. For the next few months, most of the content on my site will revolve around this pillar article. I now have 4 authors for the site that I believe will start producing content on a more consistent basis. Overall, the model hasn’t changed. I plan to continue ramping up content with the knowledge that over time Google with start indexing and ranking my content better. This increased organic traffic will lead to more people buying products through my affiliate links. However, I’m really interested in getting on the “earnings board”. Maybe I’m just overly competitive (or impatient), but I hate posting results that don’t have any earnings associated with them. As a result, I plan to start building an email list and start monetizing that list ASAP. The problem is that my site doesn’t get many visitors, so building a list through the traffic coming to my website is likely not going to build a list that moves the needle. Build an email list as quickly as possible through giveaways and contests using sources off my website. I’ll start with FB ads that have a “viral” component. This means I’ll spend some money to start getting the giveaways noticed, but the “viral” aspect will come as people share the post, tag friends, and email people they know. As people join, I’ll email them multiple times per week with products or deals in the niche they would be interested in. Since I can’t send people from an email to an Amazon page, I’ll have them go to a landing page or article on my website. I’ll make money through affiliate commissions. I’ve done contests and giveaways that have generated several thousand leads in a week, so the potential is there to build a decent list in a “short” period of time. Building a list of people that are interested in the same niche as my website. Emailing these people 3 to 5 times a week with offers or other content that keeps the list “warm”. The more people I get on my list and the more I email them, the more likely I am to earn money. As I generate traffic to my articles using sources outside of Google (my email list), I believe that Google does take notice and starts crawling your site more often which can lead to improved indexing and rankings. If I do future contests or giveaways, I won’t have to spend as much on ads because I’ll already have an email list I can “launch” it to. As these existing email subscribers share, like, and get their friends on my email list…I get lots of new subscribers. Now, all of this is easier said than done, but I’m going to give it a shot this month! I’ve seen great results in the past with similar attempts, so I hope you don’t mind me adding this “wrinkle” to the project. I may use all of these or only 1 or 2. I’ll test some things out and let you know what exact process I end up with. Below you will find the monthly report for many of the people participating in the project. As usual, I find it interesting to see people’s thoughts and how their sites are doing. Overall, I’m happy to see the effort that people are putting in! If you would like to participate in the project, go ahead and register here. Real Name or Nickname (What you want to be publicly listed as in this monthly report). Number of articles TOTAL published on your site since inception? Number of Total “Sessions” your site received in November 2018? Earnings for November 2018? What was accomplished in November 2018 for your site? (Please limit to a few sentences if possible). Feel free to link to your niche site (if you want to reveal publicly) or link to your blog where you are giving more detailed reports about your niche site. My site was launched and 8 articles were published. I found a solid writer who I trust with the copy. We have been getting views which is huge! publish an article on every week. Done few blog comments. I made the decision to restart my niche site in a completely different niche and I launched this one just 3 weeks ago. It was an old domain I owned but I had never written any content for it until now. In November, I published 3 articles and I have already seen some traction in Google with 2 articles on page 3. Continued to publish articles. Keyword research for next 20 articles. Tidied up styling of site, improved images and formatting of articles. 319 organic sessions this month. The rest from Pinterest. I plan to publish another 10 articles in Dec. I changed my niche after almost completing the keyword research. This time it moves faster, but I still struggle. I was able to earn income for this month, i have got a few powerful guest post links. The sad part is i had to delete 6 of my articles so it’s now 24. Nothing, too busy dealing with personal stuff to work on my niche site. I only posted one article as I have been very busy. Christina 23 34 0 Low times this month! Few backlinks and social signals, ill take it slowly but surely. Somehow, I needed to change the domain. The domain selection was wrong. So I’ve bought a new domain and waiting to replace it. Due to huge busy in this December with my existing projects, I think, I can start work again for the NSP4 site from the January 2019 with a big breath. About 3 articles have been created but not published. I haven’t done much otherwise. Slowly growth in this month only 5 published articles. But some of my articles is seasoning (Black Friday + Product keyword) rising to top 10 and got some earning from this keyword. I have not published any articles yet, but I have so far written ~10k words, planning to complete 20 full articles before I publish them. That would be 20*2k words, planning to publish before march. This has been my off-screen achievements so far. The number of sessions dropped in November. I think it is partly because I didn’t write good articles in November. The drag was too much. I hope to write awesome in December. Fingers crossed. 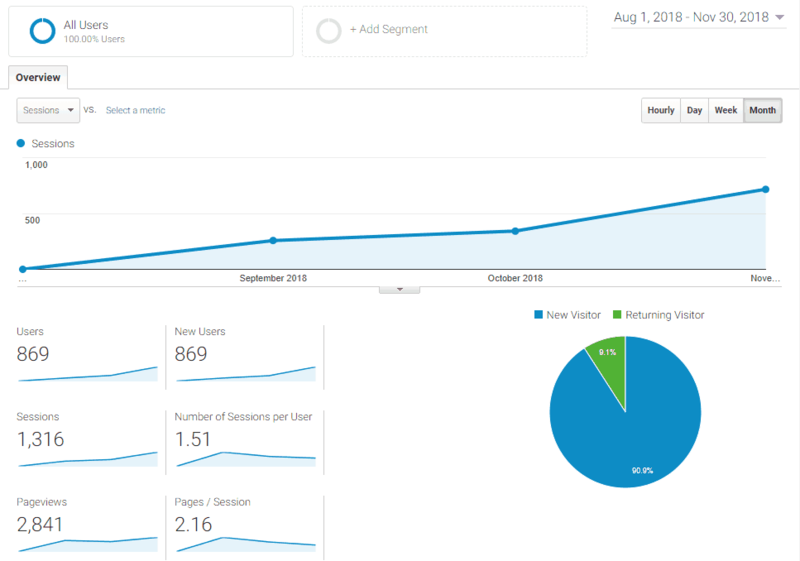 Seeing less sessions this month, but more of those sessions are starting to come from organic traffic. Have done absolutely zero link building so far. Any traffic coming to the site is coming from targeting low competition keywords. Niche research is just about completed. Working on further shortlisting the niches. Found a niche that I liked before the research phase and after further analysis, found that it may be a viable niche to get into. Purchased a domain for it and setup hosting. Installing plugins and finishing up content ideas. Will begin to write about five articles in the next couple weeks and outsource about ten additional. Set up a Pinterest account – pins are doing well, but not really translating to traffic yet. Burnt myself out on writing blog articles, but MUST get back to it. A trickle of traffic from organic search – enough to give me encouragement. I did a few long product round ups that are better than anything I have seen. It was a lot of work. I got several guest posts on high authority sites published. I hit over 2k in instagram followers and my pinterest traffic is steadily increasing. Hredoy 25 183 0 started backlink. I am still focusing on how to run the site more effectively. I finished putting a system in place for writers and VA to speed up the content but still requires me to manage a big part of the process so now I am working in creating procedures for those tasks that I feel I am ready to delegate in someone else. Also started a backlink campaign and achieved a DA=14 / TF=9 / CF=10 so I think is working very well, however not much movement in Google ranks, have a few keywords in page 3-4, but taking into consideration that I started with the new site end of September beginning of October I think it is ok.
After scrapping my initial niche site (due to the medic update), I got start late with my new niche. But ive got the site and logo built, had my first review article written, bought tablelads and have added my first comparison table. Researched and put together a new list of keywords. Finished branding, added a logo, added 4 new articles, set up an email capture, found more keywords to go after. 2 new articles published, 4 new links secured. Progress slower than hoped. Pinterest still accounts for majority of traffic to the site. Can’t fill up the target in November. I’ve a goal of publishing minimum 3 Buying Guide in November but I published only a Buying Guide. The site continues to grow. I believe publishing reviews on my YouTube channel on a couple of products and sharing on Instagram and Facebook is the reason for the views. Always improving and split-testing adsense ad placement. Earnings down slightly from last month. Spent most of November making a huge upgrade to our infrastructure and working out the kinks. Bounce rate is still too high so I want to try and bring that down. Email open rates are average at mid 30’s%. Would like to get it up to 40-50% range.